Chrysler's done a good job making the Ferrari 599XX look like its on its very own stand, but the tunnel of fail you have to walk through to see it serves as a reminder of the Chrysler/Fiat alliance. 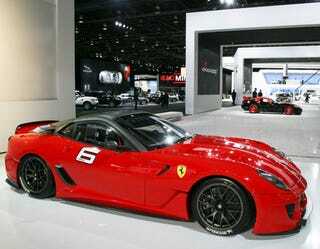 Ferrari 599XX: First Live Shots Of New Track-Ready Stallion! Of course, it also begs the question: why hasn't this been rebadged as a Dodge? A Dodge Viper 599XX would be an awful lot cooler than the Chrysler Guido.